Removing mold from walls presents quite a challenge. You may have visible mold growing on your walls, but you may also have mold growing inside your walls and removing wall mold from inside walls is not an easy matter. Before you can begin removing wall mold, you need to identify all areas that have been contaminated with mold. If you see water stains on the walls, or bubbling or peeling paint, there may be mold inside the walls. 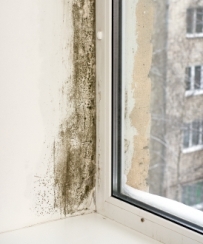 If a room has a musty odor, there may be mold inside the walls. We suggest you have a professional make an inspection if you think you have a mold problem, which we’ll discuss further in a bit. Wear old clothing you can launder as soon as you’re done removing wall mold, and wear rubber gloves, goggles and an N-95 face mask to protect your airway. If you have to throw out pieces of drywall because there is too much mold to be removed, moisten the material to help prevent mold spores from flying around in the air and then put the pieces of drywall in large plastic bags to carry through your house. Also hang sheets of plastic in doorways of rooms you’re removing mold from to prevent mold spores from traveling to the rest of the house. Mold can be cleaned from non-porous surfaces, but walls are typically made of sheetrock or drywall, which are very porous. Even concrete walls are somewhat porous, which makes it almost impossible to clean all the mold from them. The Environmental Protection Agency recommends scrubbing nonporous surfaces with a commercial disinfectant or detergent, but since most walls are at least somewhat porous, you may find you need to discard the drywall and replace it. The process of removing mold from walls often includes removing it from inside walls. To remove mold from inside walls, you must first remove the sheetrock or drywall. Since it is usually impossible to clean all the mold from sheetrock, it will usually have to be discarded and replaced with new drywall that has not been exposed to moisture or mold. However, there may be mold growing on wall studs. If they can't be replaced, that mold must be removed. 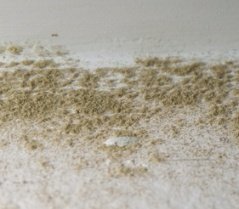 If scrubbing does not remove all the mold from wall studs, they should be encapsulated. Professionals may sand moldy wood to get to all of the mold, but sanding can put a lot of mold into the air and should only be done by trained professionals. Disinfect the surfaces with a biocide agent and allow to dry thoroughly. You may want to utilize some fans to make sure the areas are totally dry before putting up new sheetrock. Of course, you’ll have to figure out how water got in to begin with and repair any leaks. If removing wall mold from inside walls sounds like more work than you’re up for, you’re not alone. 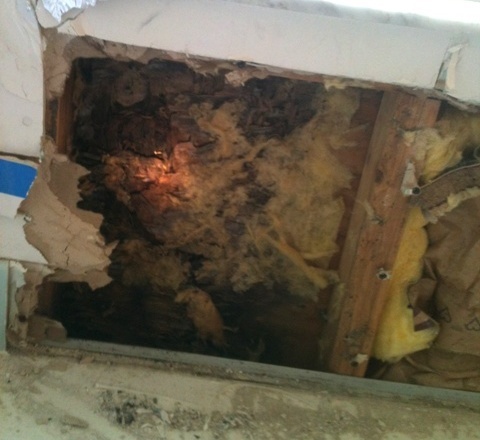 Many people choose to call in a professional for help removing wall mold for that very reason. A professional can let you know if any drywall can be saved and will know when wall studs need to be sanded or replaced. Professionals will also have all the appropriate protective gear needed to do the job safely. The best thing is that professionals will come in and give you a free assessment of the situation, a price quote, and free advice about removing mold from walls, so that even if you do decide to do the job yourself you will know exactly what needs to be done. You can follow this link to get a list of Mold Removal Specialists in your area. What you ultimately decide to do will depend in part on how handy you are, if you feel comfortable removing and replacing dry wall, and how much money you want to save. But a good professional will be happy to discuss all your options for removing wall mold with you. For additional information on removing mold on walls, including both porous and nonporous mold walls, just follow the links. We also have a special guide for the treatment of black mold inside walls.